We are constantly in search of new games to play for Family Night. 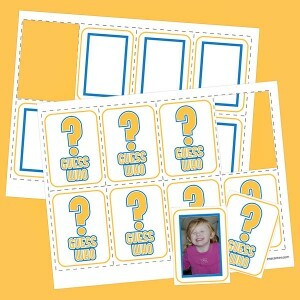 My kids loved playing Guess Who but after years of fun most of the pictures have mysteriously disappeared. With our old game missing in action I thought I would make my own and what would be more fun than using our own family pictures. I created some free printable cards to make the process even easier. To make your own, all you need to do is print out the font and the back off each card set on card stock and cut them out. Next print out family pictures. Size them down so they can be cut down to 1.75" x 2.75". Print 2 copies of each. For an easy game you will want at least 6 different family members or friends for a harder game you can do 12. 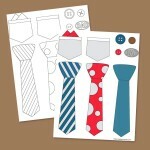 Once you have your pictures printed and cut to size, just glue them on to the cards. Here are the instructions for playing the game once you have your family face cards created. Each player starts the game with a set of cards that have pictures of family and friends on them. The game starts with each player selecting a card of their choice from a separate pile of cards containing the same 24 images. The object of the game is to be the first to determine which card one's opponent has selected. Players alternate asking various yes or no questions to eliminate candidates, such as "Does this person wear glasses?" Well-crafted questions allow players to eliminate one or more possible cards. The first person to guess the other players card wins. This is also a great game for Family Reunions, School Class Parties and Youth Groups.